I'm terrified of Lindy West, and I think her book is one of the most important to come out this year. Let's temper that last statement with the fact that, as we all know, my reading tends to consist of comedic memoirs, Victorian literature, academic feminist texts from the 1980s, and Fox Trot. But nevertheless, certain books stick out with the kind of prominence that makes you choose them rather than any of the others on the shelf. 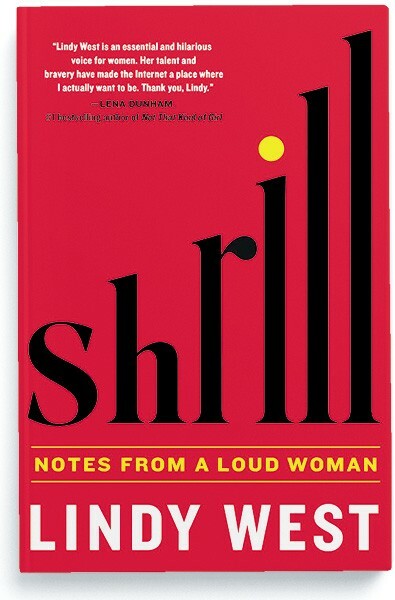 Shrill is one of these. It's an essay-based memoir that tackles feminism and internet trolling and fat-shaming. More specifically shaming a fat woman, because you can bet internet culture (and, let's be honest, regular culture) makes that distinction. When you raise every woman to believe that we are insignificant, that we are broken, that we are sick, that the only cure is starvation and restraint and smallness; when you put women against one another; keep us shackled by shame and hunger, obsessing over our flaws rather than our power and potential; when you leverage all of that to sap our money and our time – that moves the rudder of the world. Lindy West is one of the most creative and clever writers I've ever read. She's able to meld excellent writing with internetspeak, WHICH I BELIEVE IS AKIN TO DANTE'S ACCOMPLISHMENT. Her review of Titanic is still something I want framed on my wall. Shrill is a quick read, an important read, and its ideas will bounce around in your brain weeks after you've read it. It's already made me check my thoughts numerous times, examine why I thought them, and start to reframe how I view the world. Are there problems with Lindy West? Of course there are problems. But here's the thing: IF I WERE LINDY WEST I WOULD HAVE CRUMPLED LONG AGO LIKE SO MANY WATER COOLER CUPS. I can't imagine the level of abuse she takes in every. single. day. So it feels dickish to criticize how she deals with it. So instead I don't follow her every word anymore, I don't look up her writing, and when she stood 10 feet from me at Book Con, I purposely avoided her. But she's still a brilliant writer, I still love her book, and you all should read it please go do so. And seriously, read her Titanic review.